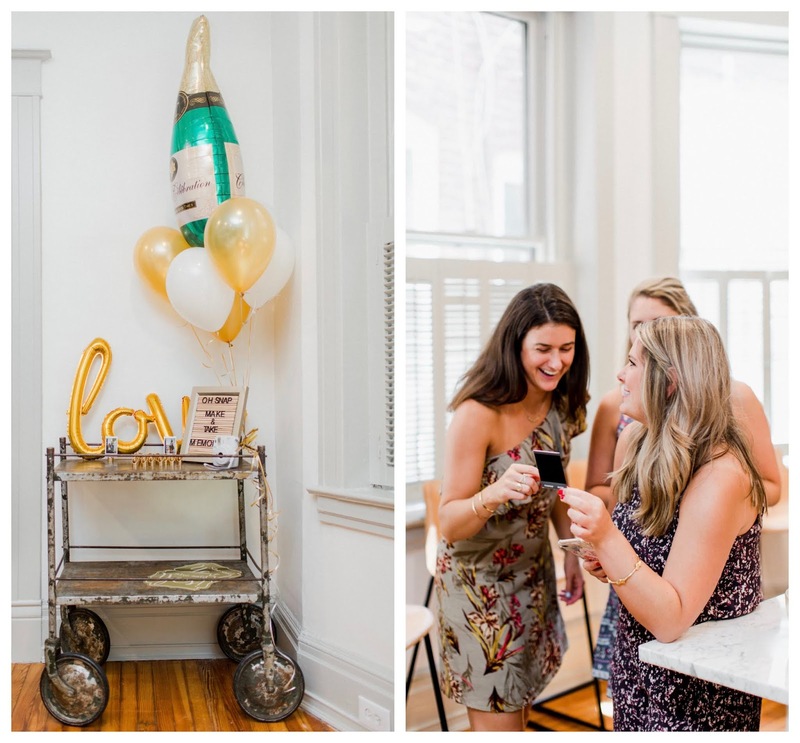 A few weekends ago we decked out the house in gold and white decorations and showered my step-daughter, Stephanie, for her upcoming wedding in what was one of the most fun celebrations we've ever hosted. 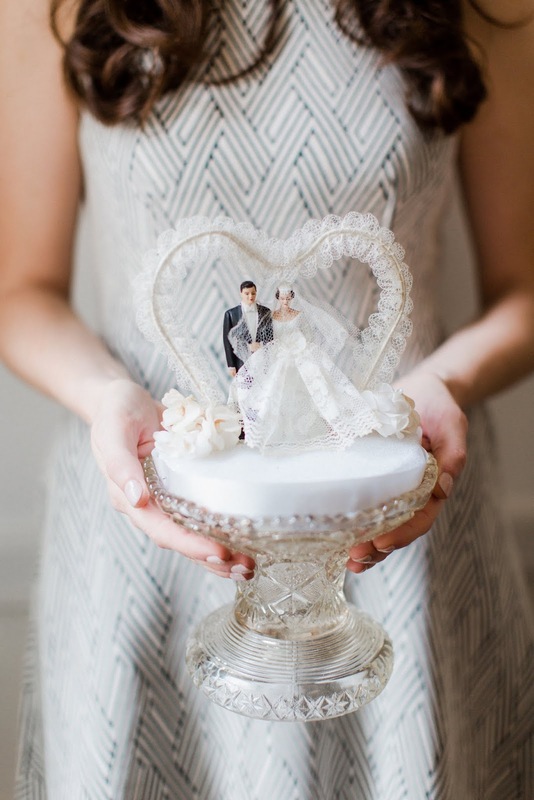 Today I wanted to share a handful of our favorite photos from the day and of course, the decorations! It's hard to believe that in a few short weeks our family will expand. 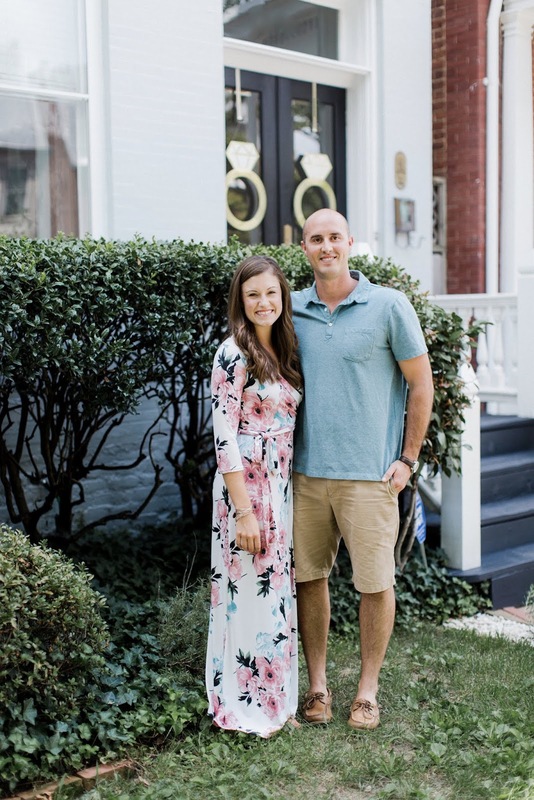 In reality, it already has — these two make such an awesome couple and we couldn't be happier for them to make it official. Stephanie and Troy drove in from VA Beach for the shower that my Mother in Law and I had been planning over the last several months. How sweet are these two? 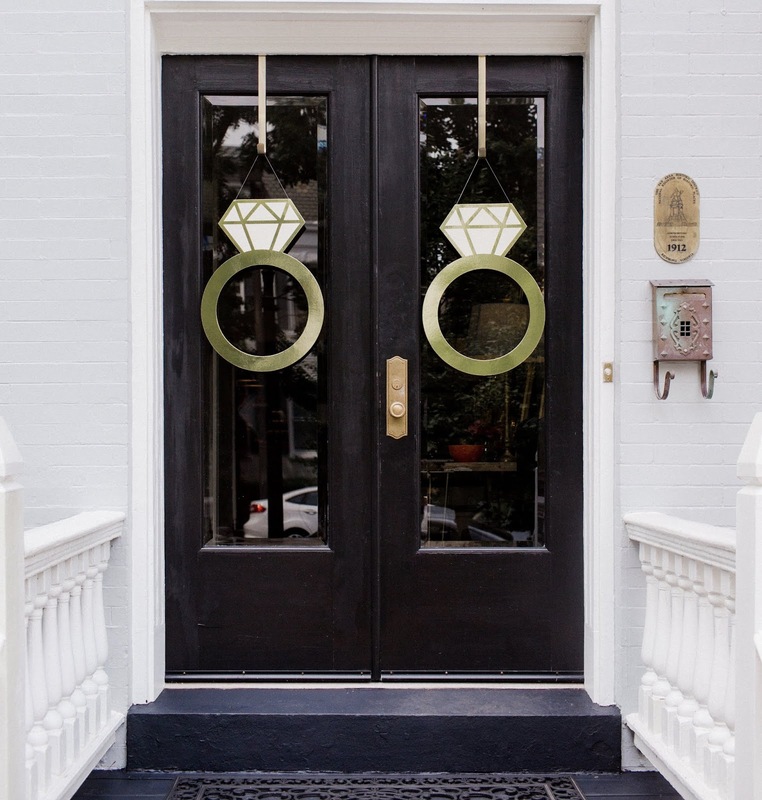 We had quite a few guests driving in from out of town and others that are unfamiliar with our neighborhood, so I decorated the front doors with oversized engagement rings to help identify our house as the place to be. The rings are cardboard photo props I'd found at the party store at less than $8 for the pair. In what may be the simplest diy project I've tackled to date, I poked holes on either side of the diamonds with a needle and threaded them to make door decorations that would hang from our wreath holders. 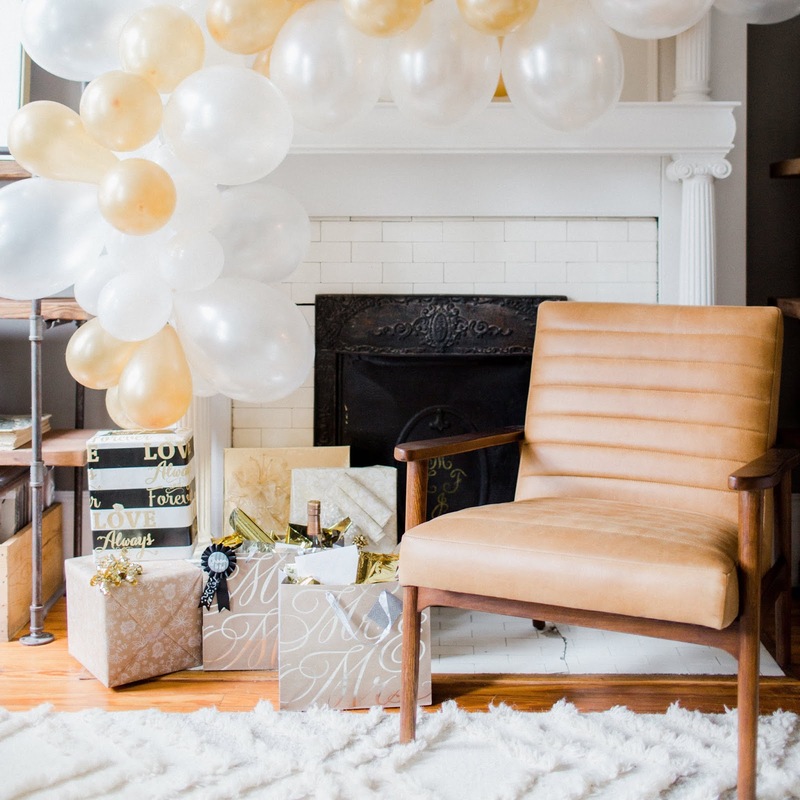 I love how minimal yet festive (and hard to miss!) they turned out. We decided on a gold and white color theme for the shower. 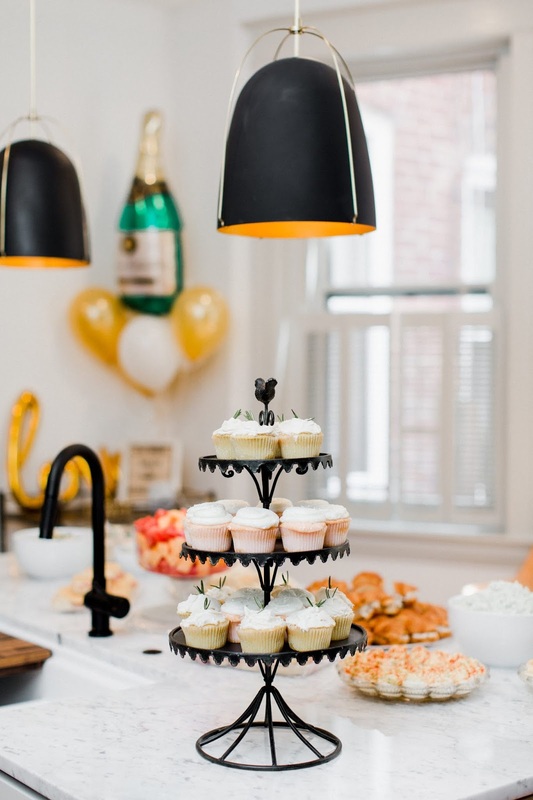 Gold is one of the accent colors in their wedding, and who am I kidding — any excuse to use a touch of shimmer is a good one in my book. 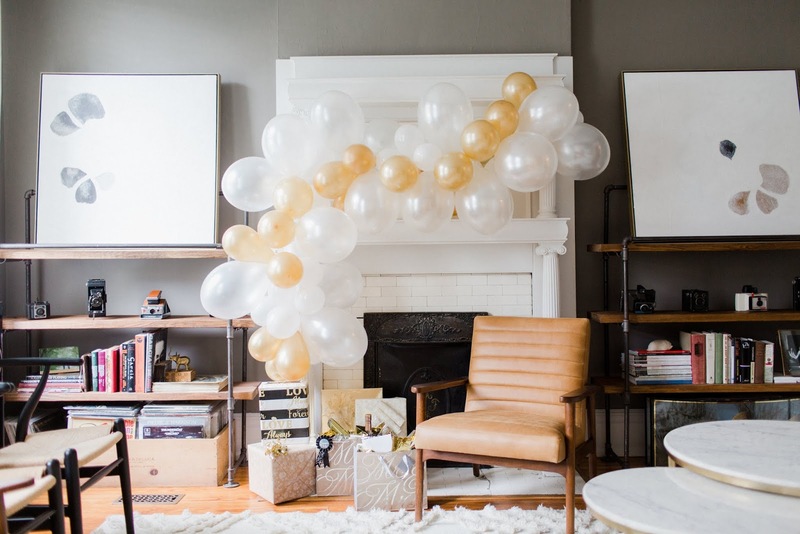 We used the front parlor as the backdrop for Stephanie's shower gifts and I framed the mantle with a garland of gold and pearlescent balloons. 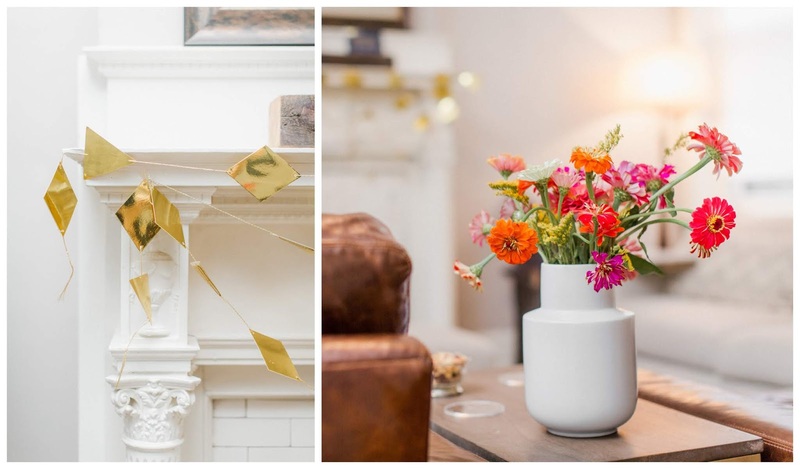 It was the only decoration we included in this room but the one with the most wow-factor in the entire house! 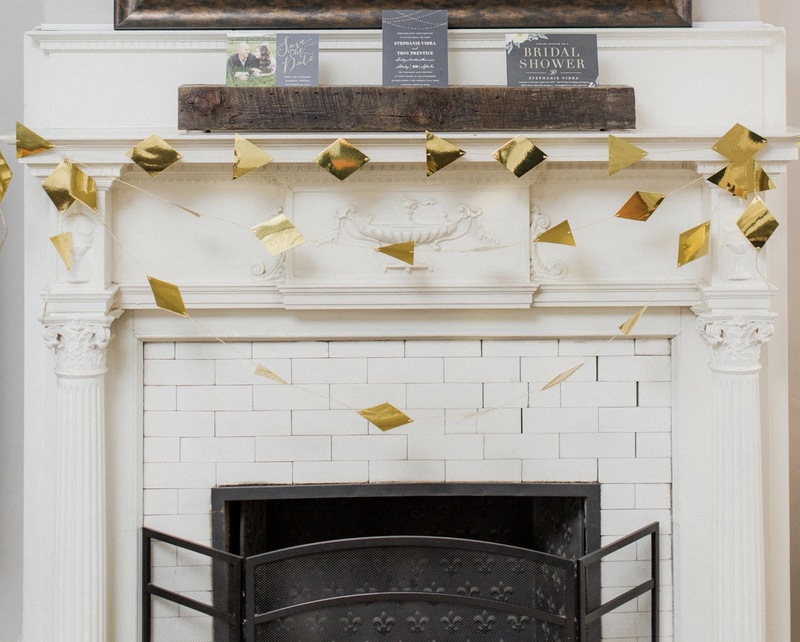 In the adjacent family room, I draped the mantle with a golden geometric garland and displayed a smattering of wedding paper goods like the save the date, shower invitation and formal invite in the reclaimed wood card display we made a few years back. Earlier in the week, my mom brought a bounty of freshly cut zinnias from her family garden that made for nice pops of color throughout the house too. Let me tell you about the kitchen! We quite literally finished our kitchen renovation the day before the shower. The addition of the exposed shelf and cabinet-front dishwasher panel came just in the nick of time. It was kind of fitting and felt ceremonious to kick off the reveal with one of the largest gatherings we've ever hosted in our home. 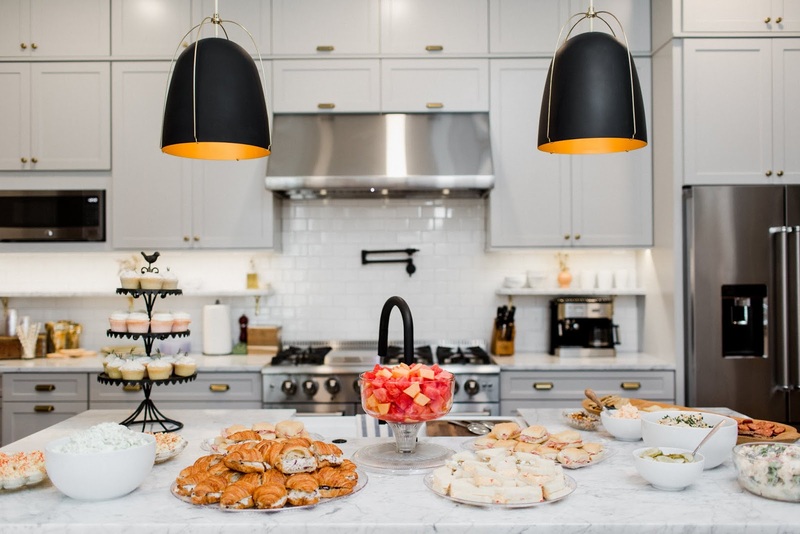 My Mother in Law is famous for her cooking and we collectively put together a spread with southern family favorites including country ham on Whitehouse rolls and pimento cheese finger sandwiches, deviled eggs and watergate salad to name a few. 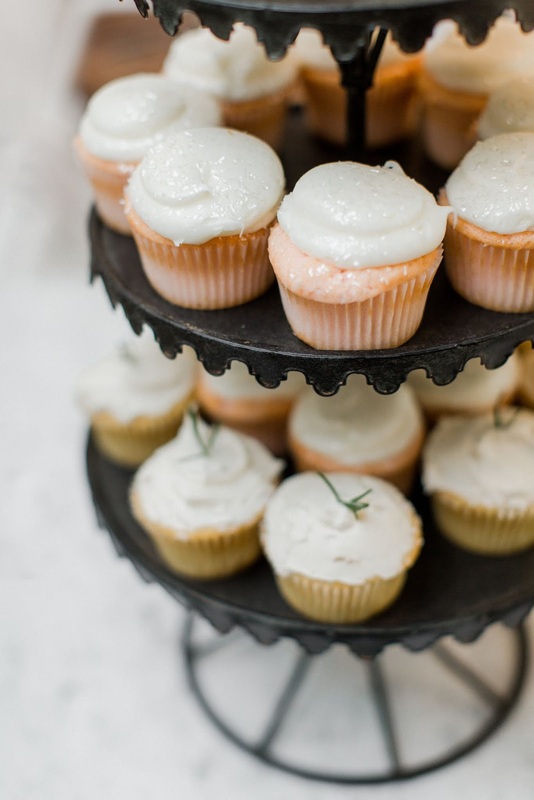 For dessert, we ordered Pearl's cupcakes. 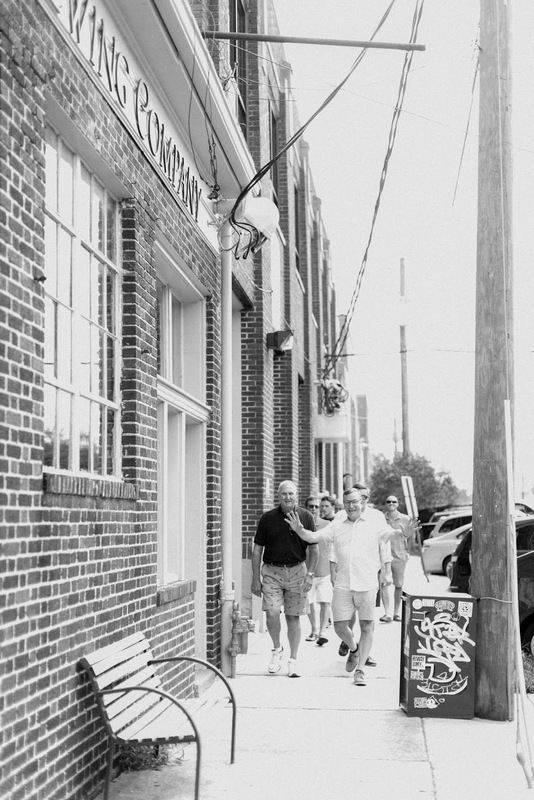 They're special to us since Pearl's made Tim and my's wedding cake and will also make Stephanie and Troy's. 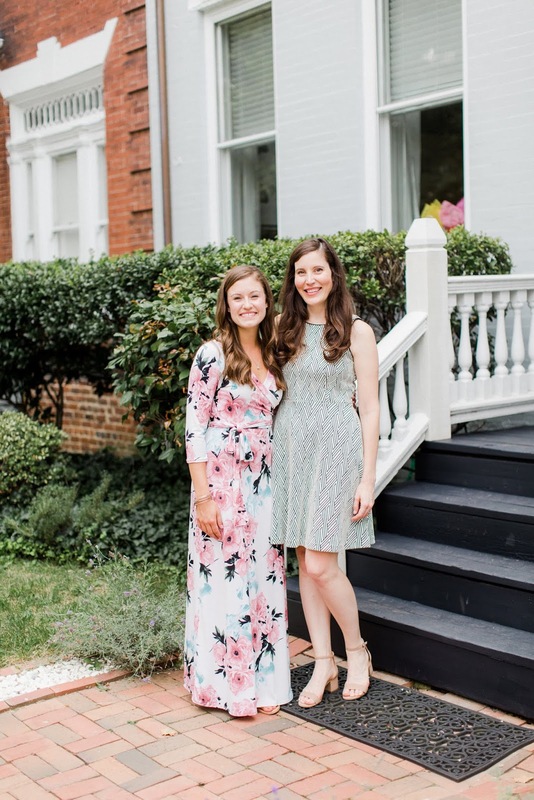 Our friend and photographer, who has attended her fair share of wedding events, shared something that stuck with me — how bridal shower food is in a rare class all it's own — the best of mayonnaise-based dishes and sweet treats. It's true! We also set up a photo-booth! I moved our cart over to the corner of the kitchen where it housed a bundle of themed balloons to use as photo props. 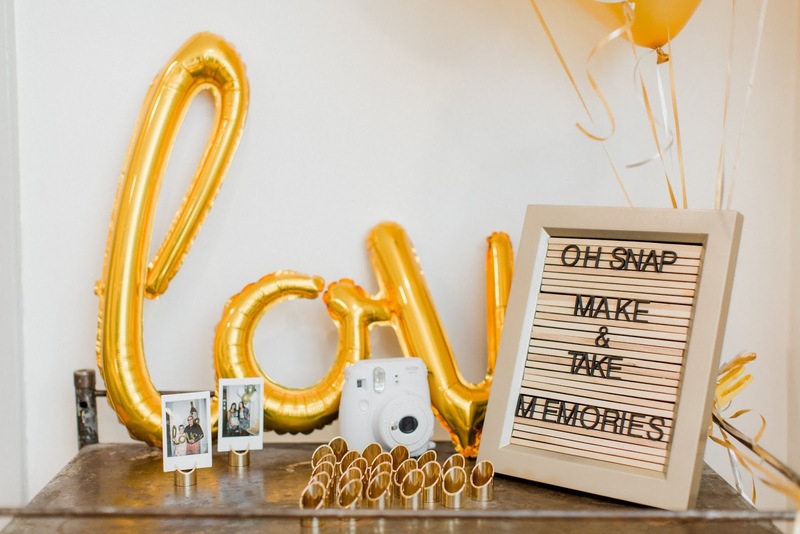 I paired everything with an Instax camera so guests could snap instant photos to take home as party favors. Looking back, I think the photo-booth was a surprising hit with all ages in our crowd and I'd do it again in a heartbeat for future gatherings. 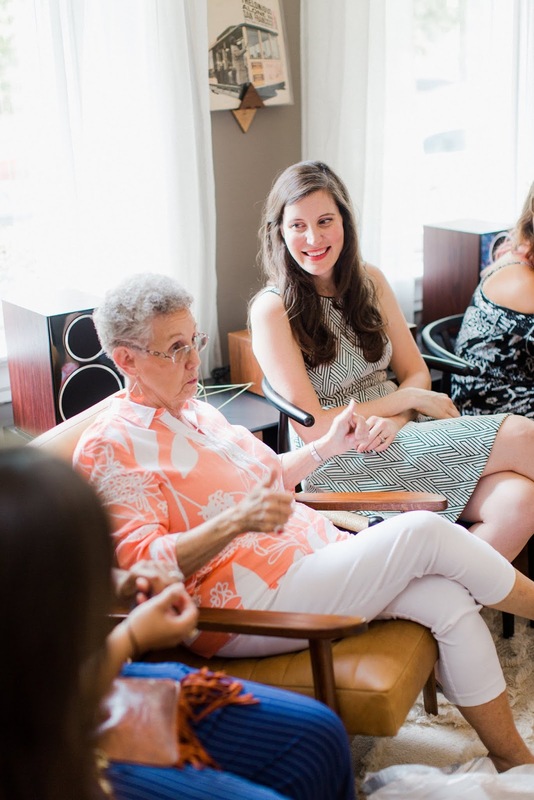 I've never been great with games, so it was such a relief that Stephanie's future Mother in Law was up for planning a few lighthearted activities to pepper in throughout the day. 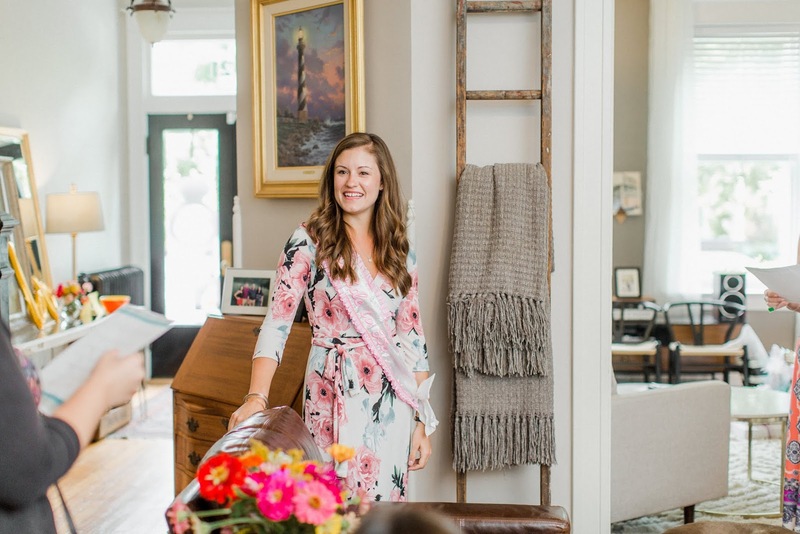 At one point Stephanie was asked to leave the room and everyone tried to recall the details of what she was wearing, like if she had a sash on or if she was wearing jewelry or heals. Another favorite was a personalized quiz about Stephanie & Troy's relationship for everyone to see how well they knew their story. The game that had everyone on their toes was called "put a ring on it." Everyone received a party ring as they arrived and were instructed not to say the words "bride" or "wedding." If you're caught slipping, you forfeit your ring to the person who heard it and the lady at the end of the day with the most rings is deemed the winner. I was pleasantly surprised to see how many people we could fit into our tiny front parlor by tweaking the layout a bit. At one point we had twenty people in and spilling out of the room to watch Stephanie open her gifts. 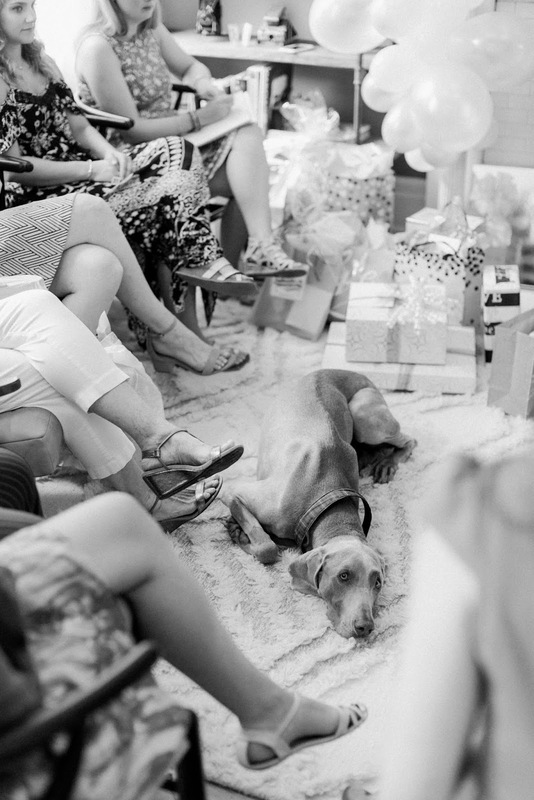 Oh, and Basil wasn't about to miss out on the fun — he came right on in and curled up on his favorite rug in front of everyone. 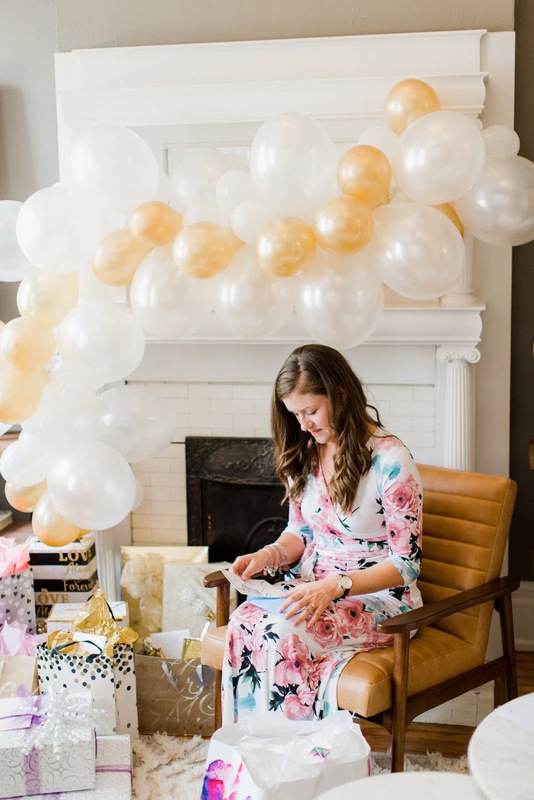 While Stephanie opened her gifts, everyone enjoyed joking about the old wives' tale that however many ribbons are cut or broken during the shower is a telltale sign of how many children the couple will have. Speaking of ribbons, have you ever heard of the tradition where a bouquet is made from the ribbons of all the presents the bride opens? Typically the bride would use the ribbon bouquet as a placeholder for the real thing during her rehearsal the evening before the wedding. 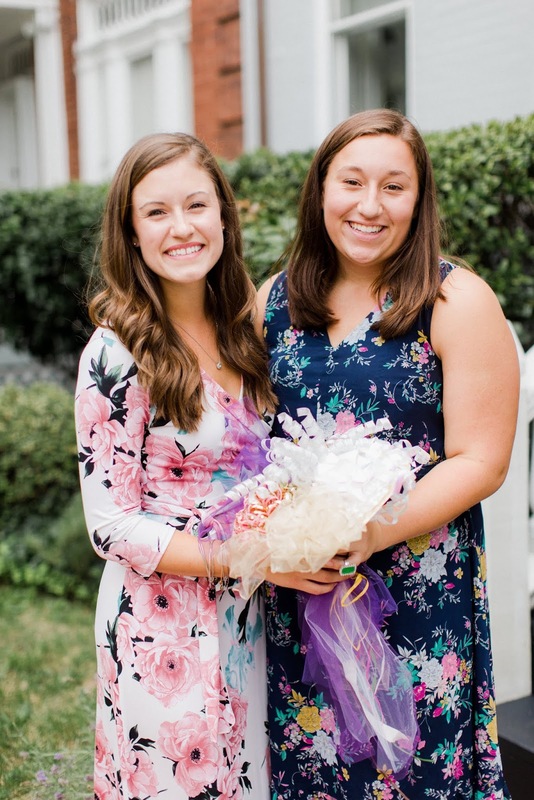 This is one of my favorite shower traditions and we asked my niece, Stephanie's younger cousin (and only other girl) on the immediate Vidra side, to take on the responsibility. She'd never made one before, which made it all the more special and fun! As for the guys, there was a little celebrating of their own going on! 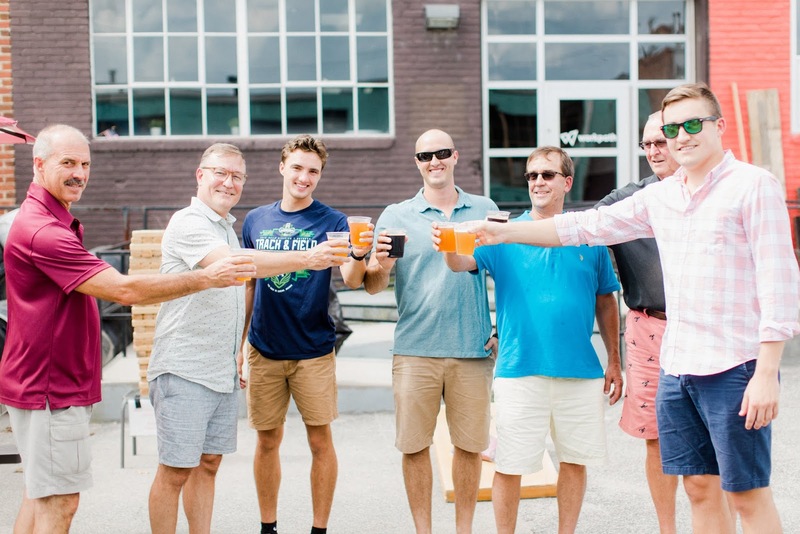 Since we already had family getting together and in some cases traveling into Richmond, Tim took the opportunity to take the groom and other "other halves" out for a little brewery tour in Scott's Addition. 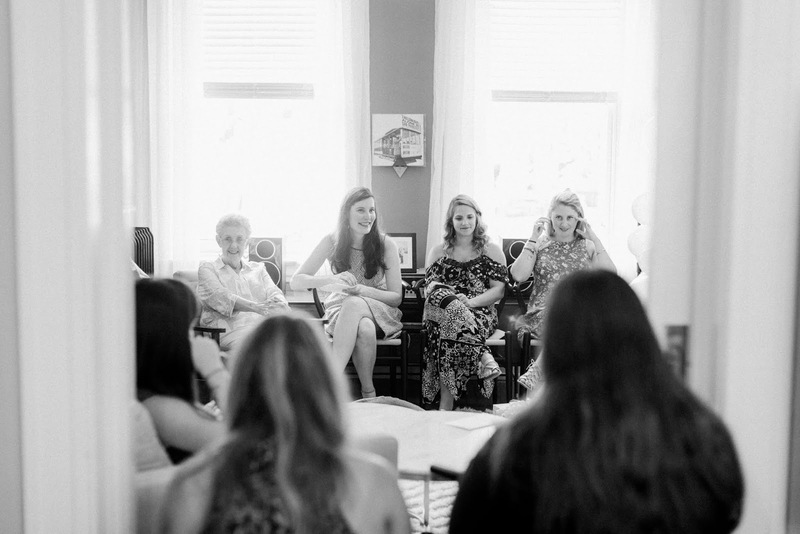 Just like a bridal shower allows everyone to get to know one another a little better, I love that the guys were able to do the same. It was such a beautiful day and so special having the chance to celebrate such a happy time in Stephanie's life. She's one of a kind and I'm so glad to be able to call her family. 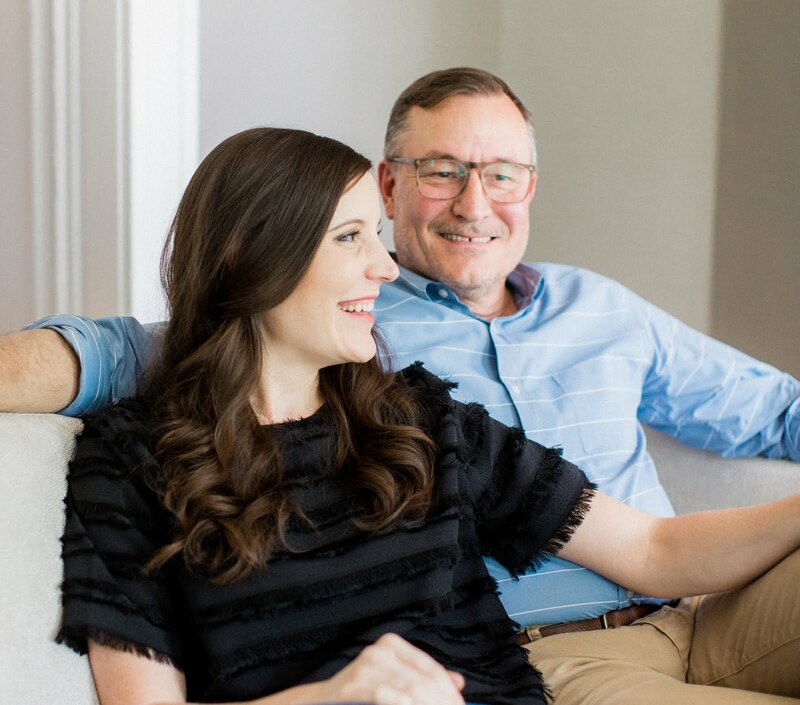 I loved seeing our home filled with family, friends, laughter, and stories — and I hope we were able to make some new memories as our blended family continues to grow and expand with this wedding. 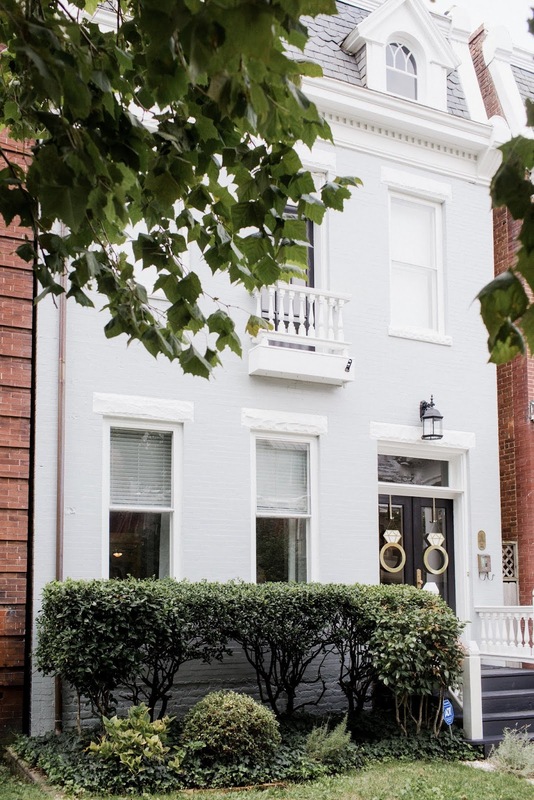 Sources: Find all of our house sources, from paint colors to furniture, located in the "House Tour" section of our site menu or skip right to the front parlor, family room, and exterior pages.